Ken-Ohki is Nagi's spaceship/pet. 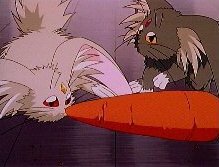 Like Ryo-Ohki, Ken-Ohki is a spaceship that can take the form of a cabbit. He is only seen in a couple of episodes but managed to get a crush on Ryo-Ohki within that short time. The above description came from Achika Masaki, and was edited by yours truly (contact me).